The Nissan Leaf continued to dominate the electric car market in Norway taking 91.4% market share during the first six months of 2013. Electric vehicles continued to increase in popularity in Norway during the first half of 2013. The Nissan Leaf is the clear electric car market leader with over 90% market share of electric vehicles sold in Norway and 80% of electric vehicle registrations between January and June 2013. Electric vehicles now have a 3.4% share of the total passenger car market in Norway. NOTE: These statistics include first-time registrations in Norway of second-hand imported cars as well as new cars bought in Norway. The popularity of electric vehicles continues to increase in Norway. New electric vehicle cars sales in Norway reached 2,228 cars, or a 3.4% of the total around 70,000 cars sold in Norway between January and June 2013. First time registrations of electric vehicles were an even more impressive 3,088 cars. These include second-hand cars imported from elsewhere in Europe. Many of these cars are basically new but sold on to Norwegian customers, as manufacturers continue to struggle to move electric cars in other European countries. 4652 hybrid cars were registered in Norway during the first six months of 2013 – just more than double the figure for the first half of 2012. Norwegian statistics do not currently distinguish between regular hybrids and plug-in hybrids. Reflecting to what extend electric vehicles are becoming competitive with standard petrol and diesel cars, the Nissan Leaf took 2.8% market share of the total new passenger vehicle market in Norway during the first half of 2013. The Leaf was the fifth most popular car model in Norway from January to June 2013, rising as high as second place during April 2013. Roughly half of all Nissan Leafs in Europe can be found on Norwegian roads. 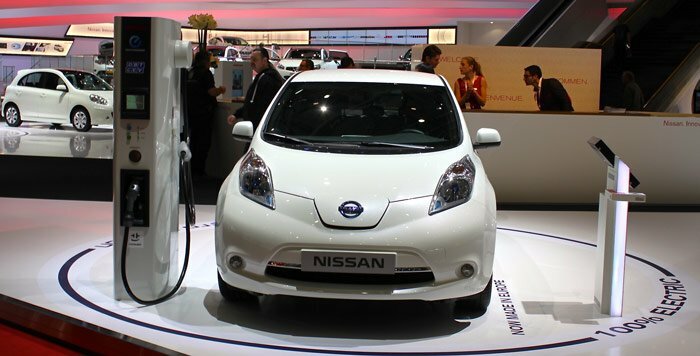 The Nissan Leaf took a 91.4% share of new electric cars sold in Norway during the fist half of 2013. Even if imported cars are included, the Leaf still has a dominating 80% of the electric vehicle market. The Mitsubishi i-MiEV was the only other electric car to have sold in significant numbers during the second quarter of 2013. Its technological siblings, the Peugeot iOn and Citroen C-Zero have reached the end of sales in Norway with electric versions of the Peugeot Partner and Citroen Berlingo due later in the year. The Nissan Leaf can expect stronger competition in Norway in coming months with new electric cars arriving such as the Ford Focus Electric, Renault Zoe and Volkswagen e-Up. More expensive electric cars due in Norway later this year include the Tesla S and BMW i3 – the current Norwegian tax regime may make the i3 amongst the cheapest BMW cars offered for sale in Norway. Reasons why Norway has become the haven of electric vehicles in Europe include special tax treatments (regular petrol and diesel cars are taxed heavily), expensive fuel but cheap electricity, and special concessions for electric vehicles such as parking in cities and driving in bus lanes. The Norwegians bought more electric cars during the first half of 2013 alone than has ever been sold in the much larger Swedish car market.